Jessica Shyba is a popular blogger who one day, innocently enough, posted some pictures of her son and new puppy on her blog, Momma's Gone City. But the pictures soon went viral and Theo and Beau became an Internet sensation. 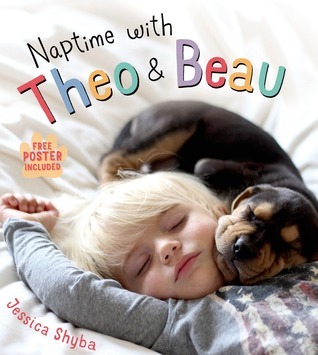 Naptime with Theo and Beau is peppered with minimal, simple text perfectly tailored for children up to pre-school age, but it honestly doesn't matter what age you are; if these pictures don't melt your heart, then, frankly, you don't have one. I mean. My heart. Oh my heart cannot handle such sweetness right now. Gah! MUST HAVE ALL THE BABIES AND PUPPIES! On his third day home with us, Theo came up to the bedroom as I quietly rocked Beau to sleep for his afternoon nap. I was nervous that they'd distract each other, but instead, he crawled right on top of Beau and they both fell asleep immediately. Each day since, Theo meets us at naptime and then wait patiently for Beau to fall asleep. I mean seriously. Why doesn't everyone have a dog? Speaking of which, while not nearly as cute as Theo and Beau napping, I feel the need to go take a nap with my dogs right now. I think Theo and Beau are sure turn the hearts of even the most reluctant nappers.